Pull up to your home bar or kitchen island in style. The comfortable cushions and solid wood construction of the Designer Backless Stool with Black Vinyl will not disappoint. The four-inch cushion provides plenty of support while spinning around a full 360 degrees. The solid wood legs are attractive and simply designed. Choose from a variety of rich finish colors. 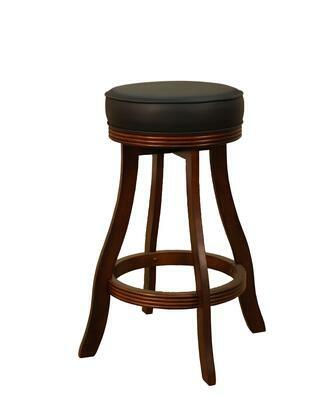 This stool is the best addition to my home bar and it really adds fun when i am sitting with my friends. This stool is really beautiful and has the best wood construction. I am very happy with my stools. Simple but graceful and also very comfortable. The thing I liked the most is that This stool can be placed anywhere. It is glamorous and I am very happy for spending money for these stools.